This handsome travel companion preserves the memory of your most cherished sites. No matter how many miles away you are, you can always keep a little piece of home close at hand. 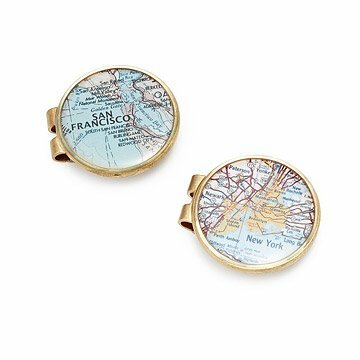 Carry your favorite place in your pocket with this handsome clip that preserves the memory of your most cherished site while keeping your money organized and accessible. Customized to the coordinates of your choosing, each map or chart swatch is immortalized in resin and mounted in bronze. Handmade by Charlotte Guptill in Portland, Maine. International locations available, but maps may be less detailed. Add extra personalization with a custom message engraved on the back of your money clip (up to 25 characters). A special gift for my Son's promotion. This was a going away present. The artists were wonderful and extremely accommodating. Although the final product was larger than I thought it would be, the gift was very unique and friends who saw it are also interested in creating one. The area depicted in this gift is rural, so I requested a customized landmark, which the manufacturer accommodated. I was displeased with the clarity of the first proof that was presented for approval, so the manufacturer did revise the proof and send an update. In hindsight, I should have requested that the customized landmark be more prominent. In the finished product, the font and geographical markings were so small that it is difficult to tell what is represented without using a magnifying glass. This money clip will be a keepsake for a life time! I gave this to my son who graduated from law school this year. The map was of Boston and where he spent those three years. It was very meaningful for him and he really loved it. This will remind our godson of his beginning as he moves forward into adulthood. There is no place like HOME. My husband loved this and the vendor was timely and sent me an email to see if they captured the part of the map I wanted. Kind of expensive for a money clip but worth it because of uniqueness and quality! This product was exactly what I expected it to be, and the quality of it is excellent. The ordering process was incredibly easy, as well.